"Colorectal cancer screening in integrated healthcare systems"
Colorectal cancer screening and early detection of colorectal cancer not only saves lives; it also saves money and resources-both for patients and providers. Screening rates are low and many barriers are present that need to be overcome in order to make a major global impact on colorectal cancer incidence and mortality. So how does screening prevent colorectal cancer and how can screening rates be increased through awareness? 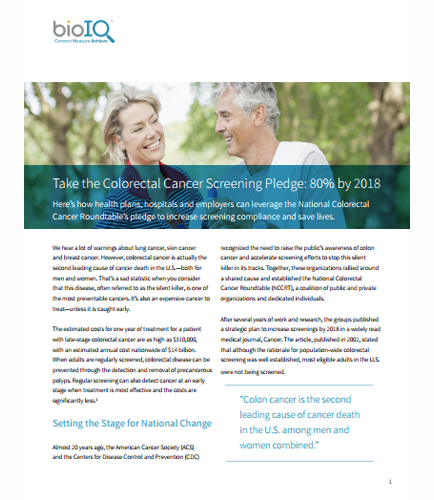 *80% by 2018 is a movement in which hundreds of organizations have committed to eliminating colorectal cancer as a major public health problem and are working toward the shared goal of reaching 80% screened for colorectal cancer by 2018.